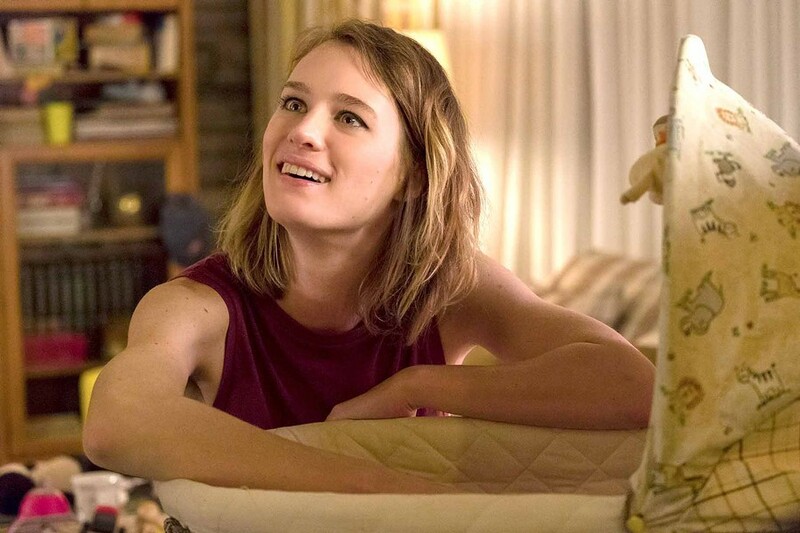 Photo Courtesy Of Bron Studios SAVIOR Tully (Mackenzie Davis) is a night nanny who develops a bond with Marlo as she helps care for her children. Photo Courtesy Of Bron Studios EXHAUSTED Marlo (Charlize Theron, who gained nearly 50 pounds for the role), is an overwhelmed mother of three desperately in need of help. Glen Reitman and Cody make good team. Juno remains one of my favorite films, and though I didn't think Young Adult was in the same league as the pair's first go-around, it was a remarkably frank look at stunted growth and narcissism. Tully takes a crack at motherhood, exploring the exhaustion it causes and the endless patience it requires. The film opens with Marlo enormously pregnant. Her first two kids have a lot of energy, especially Jonah (Asher Miles Fallica), who's prone to meltdowns. It's never brought up, but he may be on the autism spectrum. Sarah (Lea Franklin) is a little be easier to handle, but it's clear Marlo is shell shocked from all the work, and her husband, Drew (Ron Livingston), doesn't know how to help. They love each other, but he's too wrapped up in work and she's too tired from caring for the kids to spark much romance. To unwind, Drew puts on a headset and plays video games. Craig, Marlo's rich brother, can see his sister is struggling and gifts her a night nanny, which she at first refuses, but when Mia, her third child arrives, Marlo reaches her breaking point. Tully arrives one night, and she's too good to be true. She's great with the new baby, allowing Marlo to get some much-needed sleep. She also does all the things Marlo wishes she had time for, like cleaning the house and making cupcakes for her kids' classes. The film is filled with warm, touching moments. You can't help but feel for Marlo, who wants to be a good mother but is overwhelmed. Likewise, Tully is absolute magic, like Mary Poppins but young and hip. The relationship that develops between the two women is the heart of the film, with Tully helping Marlo find the joy in life again and relearn how to take care of herself. Anna Tully is the type of girl you wish you could hate—she is beautiful and young, unassuming and open, balanced yet vocal with her problems, and like Marlo, I can't get enough. Marlo is trapped in a cycle of making lunches and attending school meetings, and either completely too pregnant or with a newborn strapped to her. She persists one day after the next. The idea of a night nanny is out of her wheelhouse and readily dismissed when her brother offers what she sees as a rich man's ploy at excess. Jonah is sweet but taxing, prone to fits and full of energy. His tentative standing at his pretentious private school is a constant struggle. When Marlo breaks and finally gives in to having help come for Mia, she doesn't know what to expect, but she certainly doesn't expect Tully. Theron is a slave to her craft, and this performance is nothing less than astounding. She is raw and heartbreakingly relatable, and she gives us an unshiny, real look at the life's work that is motherhood. I for one am always impressed when an undeniably beautiful actress takes on a role that portrays her as less so, and Theron absolutely owns every bit of this character, flaws and all. Glen There's no question Theron let it all hang out with this performance. I read she gained nearly 50 pounds over three months to prepare for the role, and it took her a year and a half of hard training to get the weight off. Just as she did playing female serial killer Aileen Wuornos in Monster, for which she won the much-deserved 2004 Best Actress in a Leading Role Academy Award, Theron disappeared into this role. It's the kind of commitment that many stunningly beautiful actresses aren't willing to do, not to mention dangerous for your health. Perhaps Theron thought Marlo was a character who deserved that level of dedication. Davis is also terrific, playing Tully like an open, empathic, savior. Livingston plays Marlo's husband as a man adrift. He's blissfully ignorant of the pressure Marlo's under. It's not that he's an inattentive dad. He helps the kids with their schoolwork, but instead of helping Marlo cope, he retreats to his video games. Duplass as Marlo's pretentious brother also deserves kudos for a subtle performance. He's clearly pompous, but he just as clearly loves Marlo and is upset by how she's changed and allowed motherhood to beat her down. Marlo herself questions her choices and yearns for her carefree youth, living in Brooklyn with what may have been an early lesbian love affair. That's the heart of this story: How does she reconcile her choices, get over her regrets, and learn to love her life. Tully is there to not only help her with her kids, but to help her with herself. It's a remarkably warm and poignant film.